Hey kids! It’s Star Wars prequel stuff! Only this time, without the horrific dialogue and bad acting! And as a bonus: Evil C-3PO and R2-D2! We! Are! Winning! 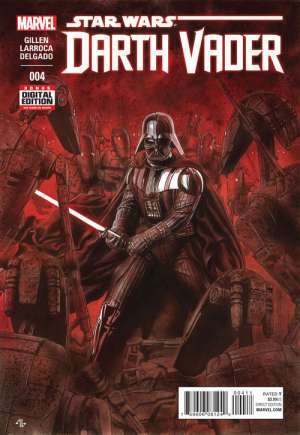 Darth Vader #4 continues to be Marvel’s most compelling Star Wars title, as our protagonist continues to hunt for the Force-strong pilot who destroyed the Death Star, and investigate the identity of The Emperor’s mysterious co-conspirator. In his efforts, he has enlisted the aid of droid archaeologist Aphra, who has led him to Geonosis, the planet that sparked the Clone Wars. Once there, Vader hopes to use the long dormant battle droids for his own bidding. The concept of Vader traveling to Geonosis and using the battle droids seems a little convenient as far as strategic use of familiar prequel-era imagery is concerned. Look no further than the cover to see this strategy in action. However, I won’t go as far as to call it cheap. The series has established that Vader trusts robots more than humans. Obviously he needs this army sooner rather than later, and given Anakin Skywalker’s experience in the Clone Wars, he has an understanding of how these droids work. So it does make a sort of sense that he’d use them. And let’s be honest, the prequel-meets-classic Star Wars element is usually pretty cool to see, as is the case here. 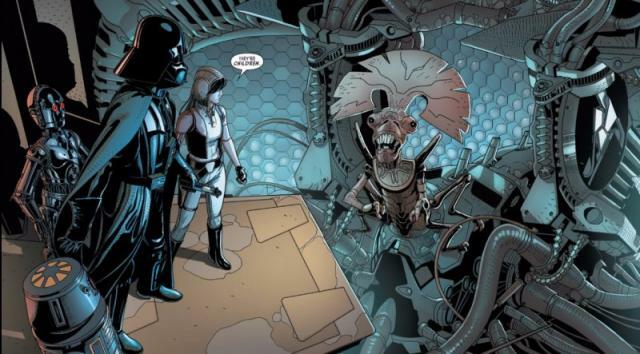 I really enjoy the Doctor Aphra character. Obviously she fulfills a functional purpose in giving Vader someone to talk to, and saying expositional stuff. But what’s really interesting is her reverence of Vader. She’s not simply afraid of him. She is his humble servant. My question is…does she have bizarre romantic feelings for him? That’s a very interesting premise. What kind of woman loves Darth Vader? And can Darth Vader somehow find room amongst all his anger and hate to feel something resembling love again? A plotline like this could be an interesting foreshadowing to the events of Return of the Jedi. But romance or not, Aphra clearly doesn’t have a long life expectancy at this point. Either Vader kills her off when he has no use for her anymore, or her choice in men becomes her undoing. Seeing Geonosis as a sterilized, depopulated wasteland so many years after the Clone Wars very much answers a “Whatever happened to…?” question left over from the prequels. It certainly seems in character for our buddies at the galactic Empire to eliminate a resource that is no longer of use. Though apparently they didn’t do as thorough a job as they should have. 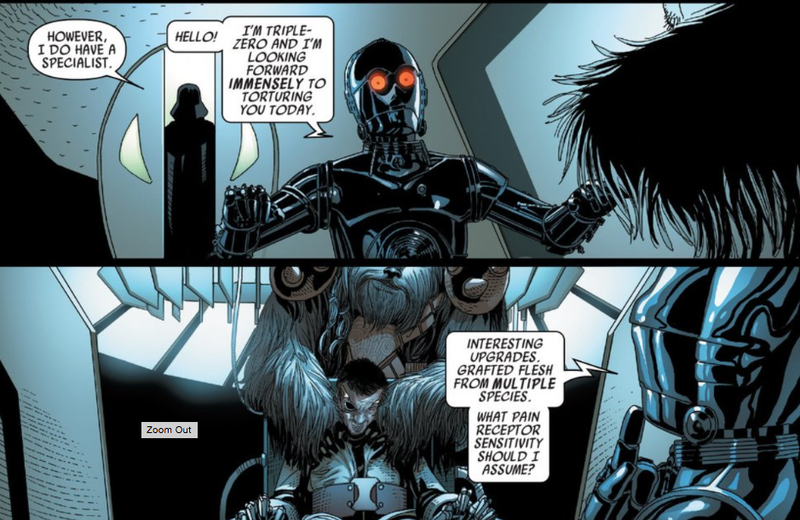 Larroca really gets to show off when we meet a surviving Geonosian queen who has taken on the remaining battle droids as her “children.” It’s an image that’s both very fitting of the Star Wars universe, and also extremely creepy. I’m very much hoping Gillen and Larroca keep rolling here. This book’s writing is compelling on a number of levels, and its art is top notch. Truly, this is a Star Wars title worthy of the franchise’s legacy. Image 1 from idigitaltimes.com. Image 2 from adventuresinpoortaste.com. This entry was posted in Comic Books/Graphic Novels and tagged C-3PO, comic book reviews, comic books, Darth Vader, Darth Vader #4, Marvel, R2-D2, Rob Siebert, single issue reviews, Star Wars, Star Wars: Episode II - Attack of the Clones on 04/13/2015 by primaryignition.